Home » Living the Enraptured Way » Living the Enraptured Way » Who will win the awards for best poetry and singer-songwriting this year? Who will win the awards for best poetry and singer-songwriting this year? 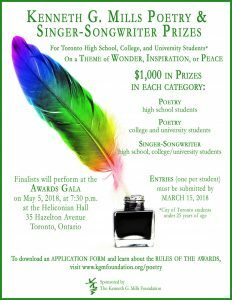 On May 5, 2018, The Kenneth G. Mills Foundation will be presenting prizes to creative City of Toronto students at its second annual Poetry Awards Gala. Come out and hear them perform at 7:30 p.m. at the Heliconian Hall, 35 Hazelton Avenue, Toronto. First, second, third, and fourth prizes (totaling $1,000 in each category) will be awarded in three categories: High School Poetry, University and College Poetry, and Singer-Songwriter. This year, the category of Singer-Songwriter has been added to the awards, and you can look forward to hearing some of the students’ compositions at the gala. Guest soprano Adanya Dunn (whose advanced music education was previously sponsored by the foundation) will also delight the audience with her vocal ease. Tickets will be available at the door: adults, $15; under 18, $10. Students were invited to choose from three themes for their work: Wonder, Inspiration, and Peace. They were encouraged to consider in their writing the theme and its drama, imagery, and impact. 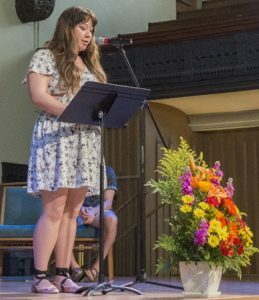 The judges, headed up by retired Toronto high school teacher and published poet Robert McAlpine, were looking for originality and freshness of ideas, perspectives, and presentation. Dr. Kenneth G. Mills (1923–2004) was an accomplished poet, composer, conductor, and metaphysician, as well as an advocate for patronage of young people in the arts. During his lifetime he published four volumes of poetry (what he described as “word paintings”), and many of his poems were set to music and performed by the a cappella ensemble the Star-Scape Singers. These singers, conducted by Dr. Mills, received acclaim at Carnegie Hall in New York City and throughout Europe, the Baltic States, and the (then) USSR. Once, when asked, “What is a poem?” Dr. Mills replied: “Prose dressed up for a ball.” Come to the ball on May 5 and support this next generation of aspiring poets and singer-songwriters! ← What is the Summer Festival and how can I attend?